There is nothing like a community speaking for itself. ‘Jo dar gaya, woh mar gaya’. I asked Muslim friends in Uttar Pradesh what has changed for them since Narendra Modi became Prime Minister in 2014, and particularly since Yogi Adityanath became chief minister in 2017. There is a general environment of fear, they said. There has been no big riot, but anything can happen anytime. They are at the mercy of the most majoritarian government ever. As the fake charges against Dr Kafeel Khan in Gorakhpur showed, even a good Muslim is a bad idea. Such fear is more over-powering than an actual riot. It is a sword hanging over them, it can fall any time. The Hindutva-inclined Hindus describe this situation as ‘showing Muslims their place’. This fear manifests itself the most in trains. Many Muslims say they avoid taking meat or even eggs during train travel. And if someone asks their name, they become nervous. They wonder why a stranger is asking their name. The incidents of lynching of Muslims across north India have made this fear all too real. All you have to say is “Gau Mata!” and summon a mob to beat a Muslim man to death. The charges of cow smuggling or beef eating do not need to be proved. Once a Hindu says the cow is under threat, it must be. It is curious that a community facing such persecution on the basis of religion is so silent. There have been few protests by Muslims against these acts of communal persecution. You see the protests by Marathas, Jats, Patels and Dalits – and you notice how Muslims make the least noise against the injustice meted out to them. What is the reason for this silence? It is mostly fear, my friends said. Nobody wants to stand up and speak out for fear of further reprisal. This has been happening for a long time. Since the fall of the Babri Masjid, there have been fewer and fewer Muslims wanting to speak as Muslims in mainstream public discourse. The Hindustani proverb about fear comes to mind – “jo dar gaya, who mar gaya”. If you cower with fear, you might as well be dead. This silence is costly. In the absence of Muslims speaking as Muslims for Muslims in public discourse, their advocacy is done by liberals and secularists. The voice of these left-liberal activists suffers from credibility when Muslims themselves are silent. In any case, the “Hindu secularist” is more delegitimised by years of propaganda than the Indian Muslim. There is nothing like a community speaking for itself. When a community does so, it is most difficult to delegitimise its voice. It becomes difficult to do whataboutery or pretend that no one lynched a man. The silence is also strategic. Muslims realise that the BJP and its Hindutva ideology want them to assert themselves, and then use it to tell Hindus, ‘Look how Muslims are being so assertive!’ The sight of a Muslim is an opportunity for communal polarisation. Muslims have internalised the idea that they must keep quiet. This strategy has had some success. The BJP had hoped Muslims would rise up and protest in a big way against its campaign on triple talaq. This would have helped the BJP show them as regressive and polarise against them. Muslims, like secular parties and activists, largely remained quiet over it. Yet the BJP uses Muslims as a dartboard to polarise anyway. One result of this strategic silence is that opportunist mullahs seeking 15 minutes of fame have occupied TV studios. They dance to the tune Hindutva wants them to, playing the bad, intolerant Muslim. From TV and Twitter, from statements by BJP leaders to anonymous WhatsApp content, the Hindutva machinery polarises anyway. The BJP needs ‘bad Muslims’ for polarisation – a Muslim who defends beef eating, a Muslim who defends misogynist family laws, a Muslim who gets provoked into violence, a Muslim who commits a petty crime, and so on. Hindutva politics requires Muslims to abide by the law more than a Hindu needs to. Hindutvawaadis have a right to break the law and get away with it, but if a Muslim does something wrong, the entire community is to be blamed. However, if Muslims appear to be on the right side of the moral argument, the BJP will not be able to blame them. After all, Dr Kafeel Khan had to be given bail when enough noise was made about his case. Prime Minister Narendra Modi has to give lip-service to the lynching issue when enough noise is made. You don’t have to be an Azam Khan to speak up. Muslims increasingly feel their voice wouldn’t be heard, and that protesting would have no impact. The BJP has risen to power without seeking the votes of Muslims. The BJP workers who go around canvassing don’t even enter Muslim-dominated localities. There is no question of the BJP giving a Muslim a ticket to contest. As a result, Muslims have no access to power, and the state behaves as if Muslims are not among the stakeholders. This is the reality, never mind the claims of ‘Sabka Saath Sabka Vikas’. Muslims may have the least access to power today, but there are many others who feel virtually disenfranchised, such as Jats in Haryana, Yadavs in UP and Bihar, tribals in Jharkhand and Dalits across India. The government of the day is not the state. There is a constitutional claim that Muslims have over the state. Giving up this claim is suicidal. Another reason for this silence is that the community has forgone the idea of having a political leadership of its own, at least in north India. In post-Partition India, it is a bad idea to have a ‘Muslim party’. As Asaduddin Owaisi knows, it immediately attracts comparison with Muhammad Ali Jinnah, the founder of Pakistan. But Muslims particularly gave up their voice and leadership since the fall of the Babri Masjid. They were persuaded by ‘secular’ parties that allying with caste politics will be in their best interest, thereby becoming the last coach of the secular train. This will soon change. Millennial Muslim youth were not born when the Babri Masjid fell, so they don’t have that fear which secular parties exploited. This is a generation who have Owaisi’s videos on their smartphones because they like that Owaisi speaks up for them. Owaisi’s greatest contribution is that he is telling Muslim youth to stand up and be themselves, and not live in fear like the Babri Masjid generation. 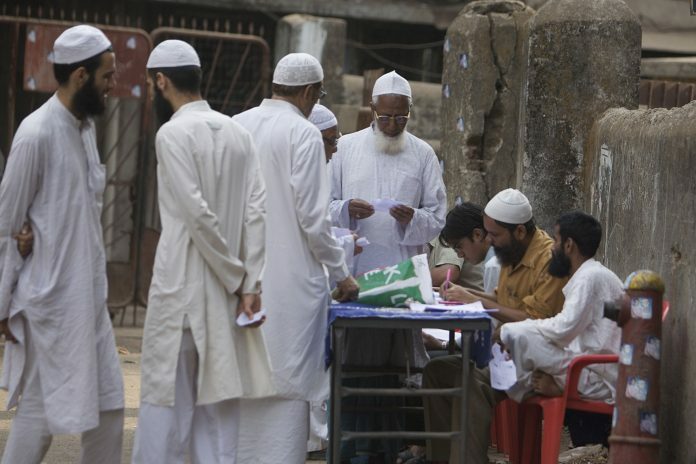 The smartphone generation of north Indian Muslims is looking at start-ups and self-realisation, not resigning themselves to the fate of electoral politics. The days of the ‘sarkari Musalman’ making hay in the secular parties are short-lived. Muslims will still need to vote for secular parties. Some Muslims have floated the suicidal idea that the community should boycott the 2019 elections. Doing so will only give the BJP 400 seats in Parliament. It is true that ‘secular’ parties today are unable to give voice to the problems faced by Muslims because the moment they do so, it will help the BJP polarise. That’s all the more reason why Muslims need to have their own voice. And, there needs to be a distinction between electoral politics and non-electoral politics. Kanhaiya Kumar, Jignesh Mevani, Hardik Patel, Chandrashekhar Azad are only some of the recent names who have made some impact in politics without flirting with political parties. The political parties came running thereafter. The Dalit movement, for instance, does not depend on how many Dalits are ministers. What Indian Muslims need the most is to assert their constitutional rights regardless of electoral politics, make interventions in the mainstream public spaces, speaking as Muslims and for Muslims, and not rely on secular parties or activists to have their voice heard. हम सभी जानते हैं कि विभाजनकारी राजनीती पूर्णतः “बहुसंखयक” तुष्टिकरण की ही रही है. यानि स्पष्ट रूप से “एक विशेष धर्म राष्ट्र” स्थापित करना ही विभाजनकारी राजनीती का मूल उद्देश्य है,और अपने इस उद्देश्य की प्राप्ति के लिए विभाजनकारी राजनीती ने, शाम,दाम,दंड,भेद आदि हर प्रकार के भेद का उपयोग करती रही है और आगे भी करती रहेगी. यानि लक्ष्य प्राप्त करने के लिए विभाजनकारी राजनीती किसी भी स्तर तक जाती रहती है और रहेगी. लक्ष्य प्राप्त करने के लिए तरह तरह के अनेक प्रकार के संगठन अपने “मातृ संगठन” से पूर्णतः अलग प्रतीत “दिखाते” हुए अपना अपना काम कर रहे हैं. जिसमें विभाजनकारी राजनीती भी एक ऐसा राजनैतिक संगठन है जो अपने मातृ संगठन को पूर्णतः समर्पित है. यानि सब कुछ सुनुयोजित है, कुछ भी अप्रत्याशित नहीं है. भिन्न भिन्न जातीय व्यवस्था के बीच किससे, कैसे पेश आना है सब कुछ “लिखित” है और ज़रूरत के हिसाब से त्रुटियों आदि को दूर किया जाता रहा है और आगे भी लक्ष्य प्राप्त करने के लिए बराबर चिंतन और मंथन किया जाता रहेगा. मुख्यतः प्रेरणा का स्रोत इज़रायल नामक देश और उसकी नीतिया ही हैं जिस पर विचार-विमर्श करके त्रुटियों आदि को दूर करके मूलतः उन्हीं की नीतियों पर चलते हुए अपने लक्ष्य प्राप्त करने की ओर अग्रसर हैं. और सब कुछ मात्र आज से नहीं है बल्कि वर्षों के अथक परिश्रम और प्रयास का परिणाम है. जो निरंतर बना रहेगा पूर्ण लक्ष्य प्राप्त करने तक. जैसे-जैसे लक्ष्य प्राप्त होगा वैसे वैसे वो सभी अल्पसंख्यक होते जायेंगे जो भी धर्म निरपेक्ष हैं और एक वक़्त ऐसा आएगा कि यह अपने विचार का प्रयोग करने के लिए १०० बार सोचेंगे और जो नहीं सोचेंगे वो किसी न किसी “घटना/दुर्घटना” आदि में मारे जायेंगे, जिसका आरम्भ हो चूका है. यानि यह होगा कि या तो वह चुप रहें या मारे जाएँ. और अंततः जैसे इज़रायल अपने लक्ष्य ( यहूदी राष्ट्र) को प्राप्त कर चूका है वैसे ही यह भी प्राप्त कर लेंगे. जिस तरह से बिना जल के मछली छटपटाती है कुछ देर तक उसी तरह से धर्म निरपेक्ष भी कुछ समय तक छटपटाते हुए अपने आप को स्वयं में बंदी बना लेंगे या मारे जाते रहेंगे. कहते हैं कि सवाल में ही जवाब होता है, यानि आज हर अल्पसंख्यक के दिलों में यह सवाल है कि वह अपने आपको कैसे सुरक्षित रखे ? जवाब अत्यंत कठिन है और सरल भी है, यानि समझ न आये तो कठिन है और समझ आ जाये तो सरल. समझने के लिए हमको यह समझना होना होगा कि कल जो अल्पसंख्यक थे वो आज बहुसंख्यक कैसे हैं ? यानि जिन विभाजनकारी विचारों को हमारे भारतीय समाज ने पूर्णतः नकार दिया था वह पनपते-पनपते इतना विकराल कैसे हो गया ? और इसका जवाब है लक्ष्य से भटका हुआ होना,और लक्ष्य प्राप्त करने के लिए परिश्रम का न होना और दिशा का न होना, एक विचार का न होना आदि और सबसे ज़रूरी है कि अपने विचारों पर पूर्णतः विश्वास न होना. यानि इसके उलट विभाजनकारी विचारों ने वह सब कुछ अपना लिया जिससे धर्म निरपेक्ष विचारों ने खुद को को अलग कर लिया. और आज स्थति यह हो गयी है कि सब कुछ हाथ से चला गया. और विभाजनकारी विचार अल्पसंख्यक से बहुसंख्यक हो गए. अब सवाल यह है कि अल्पसंखयक कौन हैं ? क्या सदियों से सताए जाते रहे वह समूह हैं जिन्हे भिन्न-भिन्न प्रकार के घृणित नामों का नामकरण प्राप्त हुआ या भिन्न-भिन्न धार्मिक समूह ? या धर्म निरपेक्ष ? इन सबका पूर्णतः एक दूसरे में समावेश हो जाना अत्यंत कठिन है और यह विभाजनकारी समझते हैं और उसी आधार पर ही राजनीती करते हैं. यानि विभाजनकारियों ने सभी को पूर्णतः विभाजित किया हुआ है और कुछ स्वयं से ही विभाजित हैं. यानि समस्या ऐसी है जो आज की नहीं है हमेशा बनी रहेगी, जब तक विचार-विमर्श नहीं होगा. यानि इसके लिए ज़रूरत है एक ऐसे विचार की जो सबको एक दूसरे में सम्मलित कर सके. वह भी “हमेशा” के लिए. और अपनी ताक़त को पहचानने की ज़रूरत है..
विभाजनकारियों की संख्या १००% में से ३३% ही है यानि अभी भी वह अल्पसंखयक ही हैं पर बहुसंखयक प्रतीत होते हैं और बाकि के सभी ६७% एक दूसरे से ही विभाजित हैं और अल्पसंख्यक प्रतीत होते हैं. यानि सभी सवालों का एक ही जवाब है:–समावेशी पर पूर्णतःविश्वास !! There could be two reasons for this unprecedented silence. One, the community is mortally afraid of the probable violence that could be unleashed by Hindutva forces supported by the governments in case they raise their voice publicly. Two, it could be an indication of the silence that precedes a storm. The Muslims are aware that if a toofan breaks out it would cause them the damage which the history of independent Indian has not witnessed. I hope and pray that my second fear turns out to be wrong because ultimately it would be my country that would suffer. And it might take decades for it stand as a secular, tolerant country once again. A section of Indian elite who resent a non-Congress government want to create issues where none exist. Mob violence is a social issue that cuts across religions. Both perpetrators and victims come from all religions. Selectively highlighting the cases where victim is Muslim is intended to portray a social issue as a communal issue and show government as anti-Minority. Since the noise by elites appears ineffective, now there’s an attempt to incite common Indian Muslim citizen. This is not what professional journalism should be used for. I agree, muslims of India should speak and assert, and voice modern and non-fundamental ideas. Daro mat! Last big protest I remember was in Azad maidan , mumbai about atrocities committed against muslims in Myanmar , some small ones were for triple talak , against Rashdie , Taslima .. for Sharia law , for palestinians . Never for jobs , education , justice , equality . As long as Indian muslims remain vote bank they will never get their share of power , they may get mosques , public prayer facility , support against common civil code and some politically motivated sympathy when lynched by non muslims . They should first develop faith in our secular , democratic constitution . Create space in every political party like vohras have created some space in BJP . Thus they can produce mass leaders who is acceptable by all the communities . What we see now muslim leaders for muslims only . What should you want us to say???? We are the second largest Muslim population in this world and seem to need to prove that we love our country. We are buried in this country, we are part of the soil, the weft and weave of this nation.That suffices. This is a poorly written article. You have to uphold yourself to the better standards you have set for yourself. You are an outstanding journalist and much more is expected from you. I am sure this will be only a momentary lapse of reason. It’s definitely one-dimensional. It’s almost as if the writer is urging them to become a bloc. The “current…. smartphone … generation” Mr. Vij refers to isn’t wasting time getting involved in Madrasa/ Owaisi style politics – they are working for call centres, hotels, banks, wherever they can for their livelihood. BJP has given a chance and a ticket to a Mukhtar (Naqvi), Shahnawaz (Hussain), Ilmi ( Shazia and Aijaz), Islam (Zafar) wherever they deserved. I too believe Monsieur Shivam Vij is made for better things. Given the nature of this article he seems to be treading in the footsteps of brainwashed journalists. Objectivity doesn’t seem to be his preferred line of thinking. Muslims of good conscience should speak up and be heard, arguing for their community’s physical and emotional security and greater access to representation in public life. The situation described in the column has fraught implications. It can lead to both alienation and radicalisation. We should not have allowed things to come to this pass.